Heras, experts in perimeter protection, continues to strengthen its perimeter security solution portfolio as it introduces G-fence, its latest perimeter intrusion detection solution (PIDS) range in the UK. Heras will be launching two variants, the G-fence 3000 and G-fence 600Z. 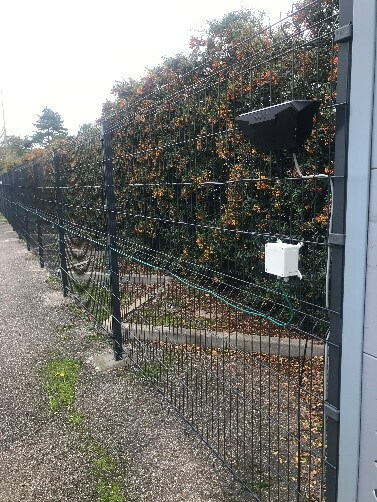 The G-fence is a range of highly reliable electronic sensor systems that, once fitted along a fence line, are able to quickly and reliably detect unauthorised access, for example where an intruder attempts to cut, pull on or climb a fence. Connected detectors along the fence, on each fence panel, monitor and analyse vibrations and movement across three axes and filter out false alarms caused by weather conditions or passing vehicles for example. Where an intrusion does occur, the nearest detector immediately (within a second) transmits alarm information to a control room, indicating the location – within three meters – of the attempted intrusion, speeding up reaction times and increasing the chance to catch the offender. G-fence 3000 provides protection for a fence line of up to 3200 metres, while the G-fence 600Z can be configured with up to 10 alarm individual zones over a maximum 600 m fence line. Other key features of the range include; solar powered controllers (Gfence 3000), anti-tampering protection and an integrated web server for setup and diagnostics, including remote maintenance and time-stamped log. The range has been designed to provide enhanced perimeter security measures for organisations operating in a range of commercial environments such as manufacturing, transport and logistics, industrial sites, as well as some critical national infrastructure sites. The G-Fence range compliments Heras’ existing Geoquip PIDS product range, including Micralert HS analyser which has Centre for the Protection of National Infrastructure (CPNI) CAPSS approval, and is the first and only PIDS on the market to have received this. It is also compatible with other Heras demarcation and entrance control solutions.